The item you are currently viewing is the Milwaukee M18FPP6B-503B Brushless 18v Li-Ion Cordless 6 Piece Kit - 3x 5.0Ah Batteries. Kit Includes. The item you are currently viewing is the Milwaukee M18FPP5H-502B 18v 2x5.0Ah Li-ion 5 Piece Kit Power Tool Kit. Milwaukee® designed and built brushless POWERSTATE™ motor for up to 10x longer motor life and up to 60% more power. 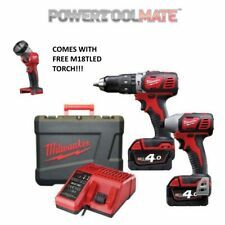 Milwaukee 12v Fuel 2 Piece Kit, including the M12FPD Combi Drill and M12FID Impact Driver. Milwaukee® designed and built brushless POWERSTATE™ motor for up to 3x longer motor life and up to 2x more power. The item you are currently viewing is the Milwaukee M18FPD-502X 18v Li-Ion M18 Fuel Percussion Drill - 2x 5.0Ah Batteries. Works with all M18 Milwaukee Batteries. Percussion Rate - 0-32000BPM. Batteries Included - 2x 5.0Ah. At 1,200 in-lbs of torque and 17.5cm in length, it has the power for demanding applications and ability to access tight spaces. The kit also includes the M18 FUEL 1/4" Hex Impact Driver (2853-20) which is the Fastest, Most Compact, and Most Powerful tool in its class. The Milwaukee M18FPD2-0 18v M18 Li-ion FUEL Percussion Drill features a Milwaukee® designed and built brushless POWERSTATE™ motor for up to 10x longer motor life and up to 60% more power. Milwaukee® designed and built brushless POWERSTATE™ motor for up to 10x longer motor life and up to 60% more power. Milwaukee M18ONEPP2A2-502X 18 Volt One-Key Fuel Twin Kit, 2 x 5. Connect via Bluetooth with the Milwaukee One-Key app. Flexible Battery System: Works with all Milwaukee M18 batteries. KIT CONTENTS 2 x 5.0Ah Batteries -NEW. Milwaukee® designed and built brushless POWERSTATE™ motor for up to 3x longer motor life and up to 2x more power. 1 x Heavy Duty Case. Battery type - Li-ion. - AB, BT, IV, KW, PA, PH, all Islands. Orders are dispatched on one of the following services. 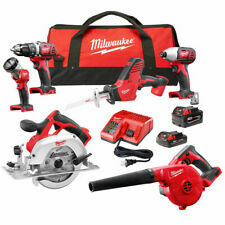 Brand New Milwaukee M18 Fuel Brushless 3-Tool Combo Kit 2997-23 MSRP is $549 tax. Brand New / Factory sealed. Please see photos before bidding as they are part of the description. 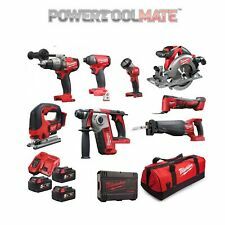 Includes: (1) Milwaukee hammer drill (1) Milwaukee impact wrench (1) Milwaukee sawzall (2) Milwaukee batteries 5.0 (1) accessory handle for hammer drill (1) contractor bag Your order will ship USPS priority mail with tracking number. M18 FUEL 18 VOLT BRUSHLESS. M18 FUEL 18V 1/2" Drive. Battery System : M18 RED LITHIUM-ION. And With 3 X 5Ah Batteries. With 3 X 5Ah Batteries. You’ll get ultimate comfort during extended use with the new contoured soft grip. The Milwaukee M18FPP3C-525W 3 piece kit is designed for the automotive tradesman. This Kit features the M12CIW38 - 1/2" 23Nm/158Nm Impact Wrench and M12IR 3/8" 47Nm Sub Compact Ratchet from the MILWAUKEE ® M12™ FUEL cordless system and the M18FMTIWF12 610Nm Mid-Torque Impact Wrench from the MILWAUKEE® M18™ FUEL cordless system. Milwaukee M18BSET2A-513B Percussion Drill, Angle Grinder,etc, NEVER BEEN OPENED. Condition is New. Collection in person only. Compared with other Lithium -Ion technologies and / or with previous Milwaukee® battery technology. The M12-B2 battery has the following specifications Battery type: Lithium-Ion. 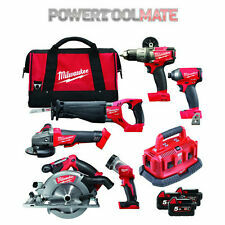 The item you are currently viewing is the Milwaukee M18BPP2C-402C Compact Combi & Impact Kit with Torch and Batteries. M18BPD 18V Combi Drill. M18BPD Combi Drill Features M18BPD Combi Drill Specification. A 2-speed gear box optimises drilling speed for when using annual cutters or twist drill bits. AUTOSTOP™ lift-off detection detects excess rotation and automatically cuts power to the drill for user protection. 1x - M18FPD - M18 FUEL percussion drill -(full details). 1x - M18CAG115XPD - M18 FUEL 115mm angle grinder with paddle switch -(full details). 1x - Tool bag. The kit also includes the M18 Generation 3 FUEL 1/4" Hex Impact Driver which is the Fastest, Most Compact, and Most Powerful tool in its class. At 226Nm of torque and 117mm in length, it increases user productivity for demanding fasteners and gives users more access in tight spaces. Milwaukee M18FHIWF12-502X Impact Wrench No Load RPM 0-550/1,400/1,750/1,750-750. No Load IPM0-950/1,750/2,100/2,100. 1 x Heavy Duty Contractor Canvas Tool Bag. LED light to illuminate the work area. Utilises the most advanced electronic system on the market, REDLINK PLUS electronics providing total system communication with overload protection providing up to 135Nm of torque, max drilling up to 55m into wood, 13mm into steel & 16mm into masonry. 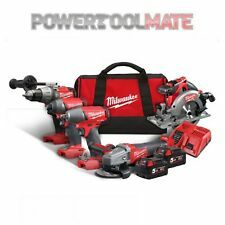 Milwaukee 2799-22CT M18 18-V Lith-Ion Cordless Compact Brushless KIT 2017 NISB! !